از عمده‌ترین موانع شناخت حقوق بشر ابهام‌آمیز بودن مفهوم بشر است. فیلسوفان سنّتی با رویکرد ذات گرایانهٔ ارسطویی بشر را تعریف می‌کنند و مدّعی هستند که چنین تعریفی بستر لازم برای شناسایی بشر را فراهم می‌کند. 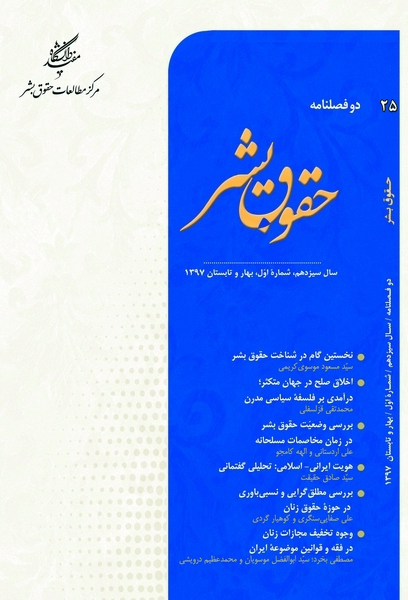 در این مقاله ضمن بررسی رویکردهای افلاطونی و ارسطویی به شناخت بشر، نشان می‌دهم چگونه تعریف ارسطویی بشر نه از کفایت فلسفی برخوردار است و نه کارآیی عملی دارد. بعلاوه، این رویکرد مسبّب بسیاری از سوء برداشت‌ها دربارهٔ حقوق بشر است. سپس ضمن نقد مبانی ذات گرایی، رویکرد جایگزینی مبتنی بر سنّت تحلیلی برای تعریف بشر ارایه می‌کنم که بر اساس آن «تعریف بشر» با «معنای کلمهٔ بشر» معادل است. این رویکرد هم از خطاهای فلسفی رویکرد ذات گرایانه بری است، هم برای تشخیص مصادیق بشر عملاً کاراست. The ambiguity of the concept of human is of the main obstacles in understanding human rights. Traditional philosophers take the Aristotelean essentialist approach to define human and claim that such produced definition provides us with a needed basis for the discovery of human rights. In this article, I elaborate on the Platonist and Aristotelian approach to the understanding of human and show how Aristotelian definition of human is neither philosophically sufficient nor practically applicable. Furthermore, such an approach is the root of many misunderstandings of human rights. Next, through criticizing the basis of essentialism, I present an alternative approach for defining human in analytic tradition based on which the “definition of human” is equivalent to the “meaning of the term human.” This approach is both immune to the philosophical flaws of essentialist approach and properly applicable to identify the instances of human. Aristotle (1995). Topics, In: The Complete Works of Aristotle, The Revised Oxford Translation, edited by Jonathan Barnes, Vol. 1, Princeton: Princeton University Press,. Aristotle (2002)A. Categories and De Interpretatione, Translated with Notes by J. L. Ackrill, Oxford: Clarendon Press. Aristotle (2002)B. Posteriori Analytics, Translated with commentaries by Jonathan Barnes, New York: Oxford University Press. Aristotle (2004). Nicomachean Ethics, Translated and Edited by Roger Crisp, Cambridge: Cambridge University Press. Lesher, James (1973). “The Meaning of ΝΟΥΣ in the Posterior Analytics,” Phronesis, Vol. 18, No. 1, pp. 44-68. Plato (1997). Complete Works, Edited by John M. Cooper, Indianapolis: Hacket Publishing Company. Quine, W. V (1966). “Three Grades of Modal involvement,” In: The Ways of Paradox and Other Essays, New York: Random House, pp. 156-74. Quine, W. V (1981). “Intentions Revisited,” In: Theories and Things, Cambridge: Harvard University Press, pp. 113-23. Quine, W. V (2013). Word and Object, Cambridge: MIT Press. Smith, Robin (1999). Logic, In: The Cambridge Companion to Aristotle, Edited by Jonathan Barnes, Cambridge: Cambridge University Press, pp. 27-67. Wittgenstein, Ludwig (1991). The Blue and Brown Books, Oxford: Blackwell Publishing. Wittgenstein, Ludwig (1999). Philosophical Investigations, Translated by G. E. M. Anscombe, Oxford: Blackwell Publishers.